In many ancient Asian cultures, the smooth wholeness and seemingly “magical” appearance of pearls in such lowly lifeforms as oysters indicated the presence of divinity. The pearl represented the journey of the soul or spirit along the path to perfection. In ancient burials, mourners placed pearls in the mouths of the deceased. 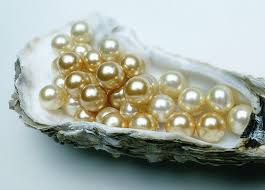 Since pearls apparently contained the principles of life, they hoped they could assist the dead on their journeys beyond. Mourners also decorated burial gifts and clothes with pearls. This seemingly ritual act may have started as a practical act. Pearls were among the first materials used for beads. Their natural bead-like shape made them easy to use for decoration and yielded lovely results.